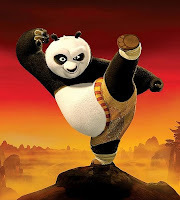 Everybody Loves Kung Fu Fighting…..
About a month ago my family cuddled up on the living room floor surrounded by pillows, covered in blankets and our bowls of popcorn clutched in our hands to hold our first ever family movie night. Our three boys sat riveted, shoving fistfuls of popcorn in to their mouths as they watched Po and the cast of Kung Fu Panda fight their way through China. We ate junk, laughed and just genuinely enjoyed spending time together. The movie was great, but the company was awesome and I realized something…. I don’t take enough time to enjoy my kids this way. Just being with them, doing what they want to do. Can you believe my oldest is almost 5 years old and this was the first time I had sat down to watch an entire movie with them. This isn’t to say that they haven’t watched a movie or that their dad hasn’t sat down to watch one with them, but I never had. I know, I know…. I do lots of other things with them and that is good, but what really struck me is just how much I enjoyed “being” with them, in the moment, in the now. I wasn’t thinking about the other things I “should” be doing, or the fact that they should be in bed, or even that cartoons aren’t my favorite movies to watch. I was just enjoying them. The way the two younger boys were huddled around their big brother, the way my oldest covered his eyes when he was embarrassed for the character, or the way they laughed to the point of tears at the antics of Po (the Panda). As our laughs blended together to become one giant family laugh, I realized that I need to do this more. As the wise, old, tortoise/sage, Oogway, says in Kung Fu Panda, “The past is history, tomorrow is a mystery, today is the present that is why they call it a gift.” While these may just be words from a secular kids movie, I believe they hold Biblical truth. You see, often times as moms we live in a house of yesterday. We lie in beds of regret covered with blankets of guilt. Our thoughts are constantly on what we should have done, how we could be better, and why we didn’t do what we think we should have done. Our guilt holds us captive in closets of shame, rendering us incapable of dealing with the present situations of our lives. What a tool of the enemy regret, guilt and shame are. But Christ came, to seek and save the lost (Luke 19:10). He did not come to condemn the world but to save it (John 3:17). He came that we may have life (life today) and have it to the fullest (John 10:10). On the other side, many of us walk through life waiting for and worrying about tomorrow. We worry about how to pay the bills, whether our kids will make the right choices, whether we are doing enough now, and on and on. Or like me you often find yourself waiting for the next thing…. The next vacation, the next moment of silence, waiting until you have it all together, or waiting to sit down and enjoy a movie with your kids until the laundry is all done or you have enough extra meals in the freezer. And when fear of tomorrow finally closes its strong jaws around our hearts we grow desperate to escape, and change our present circumstances. This line of thinking just sets us on a road of disappointment. There is never enough money, our kids won’t make all the right choices, we are never going to do enough, have enough or be enough. And the next best thing is still next. We are so blessed that our Father in heaven has made provisions for us. We don’t have to worry about what we will eat or drink or what we will do tomorrow, for our Father already knows our needs and HE will give us all we need from day to day (Luke 12:28-31). I know that our present may not seem to be a gift. Our circumstances may be filled with pain and loss. Our children may be hurting or causing us pain and we may feel like today is just a disaster waiting to happen as our little children tear like cyclones through our houses and our lives. But Jeremiah 29:11 says, “For I know the plans I have for you,” declares the Lord, “they are plans for good and not for disaster, to give you a future and a hope. In those days (TODAY) when you pray, I will listen. If you look for me in earnest (TODAY), you will find me when you seek me.” We are only able to trust or accept our situations in life as a gift when we trust the kindness of the Giver. He loves us and His gift to us is Life….life after death, but also life today. Today is the day to stop holding on to the past or waiting for the future. It is time to sit down and hold tight to your children, enjoying them for what and who they are. Yes, they may be exhausting and trying, but they are beautiful, good and perfect gifts from a Father who knows you so well and who wants you to enjoy them Today. I really needed to hear this. Especially the scripture in Jeremiah 29. Thank you so much!